It?s 3 p.m. on a sunny and peaceful Sunday. A family sits at the table, enjoying a pleasant after-lunch conversation outdoors. A few yards away, the grill emanates its last puffs of smoke. It?s a moment of intense and simple pleasure: sharing conversation, jokes and a meal with loved ones. Suddenly, a ruckus revolutionizes the easy atmosphere. Why?Â In Argentina, people are used to giving a big round of applause to the barbecuer, the asador. It?s said that Argentines are so conceited, that when they see a lightning, they think God is photographing them. Is that why Argentine barbecue mavens are so vain that they need to be cheered like artists? But few Argentine traditions are as deeply rooted as the ritual of meeting to eat good barbecue. Asado is a whole declaration of principles of our national being. Like other national passions — tango, good wines and soccer — barbecue is an exquisite ceremony, where collective legends and personal techniques intermingle. An asado can be organized for practically any occasion. Nowadays, asado is also cool. Many young couples prefer to substitute lighthearted outdoor barbecues for solemn wedding menus. The smoke of the embers and the asado aroma seem to be an ideal backdrop for swearing eternal love. Barbecue also reigns at the tables of power. At the Quinta de Olivos, the presidential residence near Buenos Aires, we can find a generous grill, always ready to be fired up for a power lunch. Many Argentine presidents have turned asado into the national menu, for discussing public policy with their ministers, solving differences with their political foes, or receiving foreign visitors. The late Argentine president NÃ©stor Kirchner once presented U.S. president George W. Bush with a lamb from Patagonia (the Kirchner family comes from that region, where roast lamb is a delicacy). The relationship between asado and Argentine cultural identity is also reflected our language. If we?re fully committed to a project, we?ll say we?ve ?put all the meat on the grill.? Journalists call an article ready for publication parrillero — grilled and ready to eat. Roberto Pettinato, a David Letterman-like local showman, hosted a TV talk show called ?A Round of Applause for the Asador. ?Â The whole thing revolved around a barbecue lunch. Asado is not a product of planned or methodical application of fire, but of the unhurried and magical action of the embers. The great secret of asado is the slow, ceremonial way of cooking the food. It requires patience. That?s why the cook’s skills are tantamount to those of a tribal sorcerer. He zealously preserves his secrets. When he offers the first chunk of grilled meat to another man, we should not interpret this as an act of impoliteness toward the ladies present. Rather, this is one sorcerer?s challenge to another. If the recipient celebrates the morsel, the asador wins. A close friend of mine who is a sociologist often says that taming the fire to make barbecue offers the male a re-encounter with his mythic essence, when he had to risk his physical integrity to get food. Sylvia - his wife, and a sociologist too- replies that the fire for asado is the pillar of contemporary marriage. ?When we women learn how to make a good fire,? she jokes, ?we will no longer need any husbands.? There are many reasons to come to Argentina. Perhaps you?ve already heard about our vast geography, our incredible ice landscapes, our endless Atlantic beaches, or our mysterious valleys and mountains. 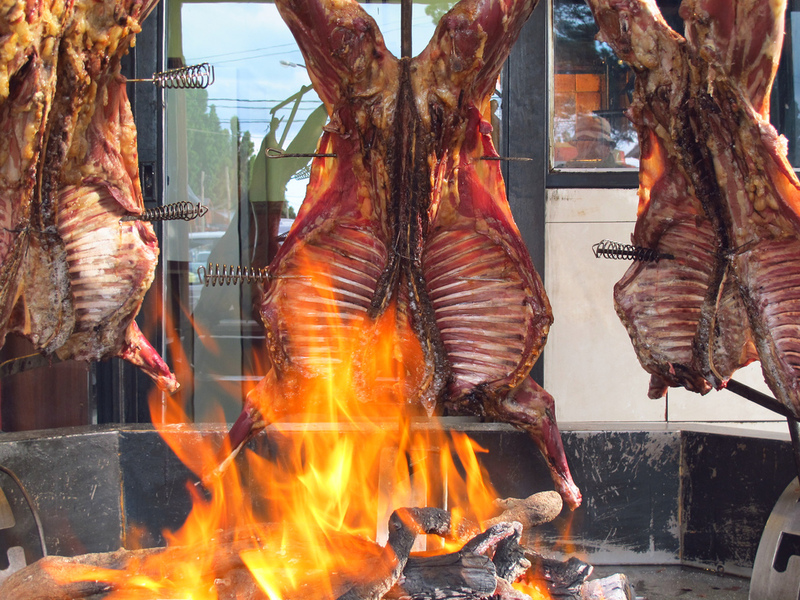 Gourmets will also find vast gastronomic choice on offer in the streets, including authentic Argentine barbecue. But the real trip to the heart of this ritual is a visit to an Argentine home, to sit at the table with a local host. Don’t think this is unlikely. Argentines adore inviting visitors to learn about the delicacies of their tables. A casual interlocutor you meet at a bar, or in tango class, might well invite you home to savor a barbecue. If you are willing to embrace the adventure, remember the protocol: the guests are in charge of bringing the wine. And when it?s over, you, the guest, should be the one to call for the signal of appreciation: ?Un aplauso para el asador!? The authentic Argentine barbecue is characterized by the great variety of meats, each requiring a different cooking time. The largest cuts may take more than two hours to reach perfection. An asador generally prefers to make the fire with quebracho, a South American hardwood tree, or carob wood. You can try both typically Argentine meat cuts, or offal.Â Since offal cooks fastest, it is served first.Â The most typical parts are chinchulines (entrails), mollejas (sweetbread) and morcillas (blood sausage). But the most popular cut, and the one I especially recommend, is chorizo. This is a fresh sausage containing a blend of ground pork chunk of meat with spices. It’s derived from traditional Spanish and Italian cold cuts. Chorizo should be rinsed in water for at least two hours.Â Prick it before placing it on the grill, to allow the grease to drain. Brown it on the outside, over a strong fire, then allow it to cook slowly, over a very light fire, until it is dry. Some prefer to cut the sausage in two, opening it in the middle, and cooking it inside, too. You can eat this as a sandwich, on bread also heated on the grill. Entrails and sweetbread should also be carefully washed and soaked, then grilled until they are intensely browned. Blood sausages should be neither soaked nor pricked. Simply heat them over a weak fire, as this sausage comes pre-cooked. Cook entrails over a light fire. They?re delicious dressed with lemon. The most classic cut is asado de tira, or rib strip, from the cow?s rib cage. It?s a voluminous, delicious meat that cooks quickly. Placed the strips facing downward on a very hot grill, so the bones get roasted first. Turn after about 15 minutes. The wider the cut, the more juicy and tender after roasting. You?ve probably heard of Argentine soccer idol Diego Armando Maradona. And you probably know that soccer is our country?s greatest sport. But you may not know about our other national sport: philosophical arguing. Any issue, insignificant or essential, can draw two Argentines into hours of passionate argument. They may argue, for example, about the role of salt in a barbecue. Some of our best chefs point out that salting the meat before placing it on the grill is the best way to preserve the juice, since the salt forms a soft layer that keeps the meat slightly crunchy outside, and tender inside. Others believe the salt absorbs the juice, and therefore turns the meat very dry. 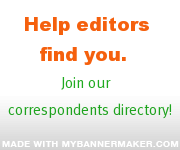 May each reader hew to his own view. Elizabeth Levy Sad is a writer based in Buenos Aires. Translated from the Spanish by Daniel Epstein.